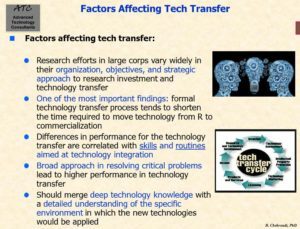 What is Technology Transfer (TT)? "A process which, through an explicit or implicit phase of research and development (the application of scientific knowledge), allows for commercial production of goods or services." its ability to absorb andadapt those technologies to which it is exposed (the pace at which technology diffuses within the country). 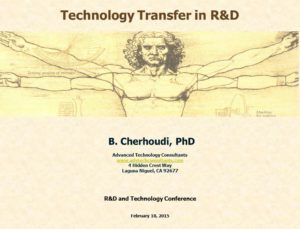 Technology transfer has been practiced in most of the developing countries as well as countries in economic transition . This is because in a large majority of such cases, these countries do not have their own R&D and industries for producing the required technology. 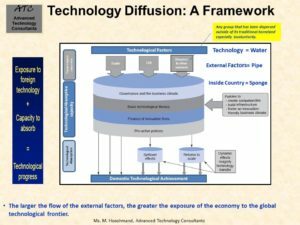 In contemplating a transfer of technology, there are a large number of factors that need to be considered. Research has shown that most failures of technology transfers occur because of inadequate analysis or ignorance of a set of important factors. 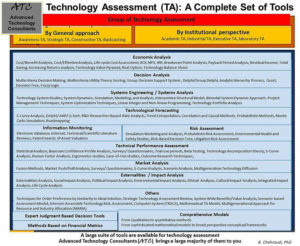 Two important elements of the technology transfer are "Need Assessment" and "Technology Assessment". Thorough assessments often minimizes the risk of failure in developing countries. In such countries, failure itself is a tragic event. This is because the financial resources in these countries are often limited and a failure in technology transfer may easily prevent the basic needs to be met. Additionally, such failures at times create the idea of an inevitable fate, that is, "nothing works, all efforts are bound to fail!" 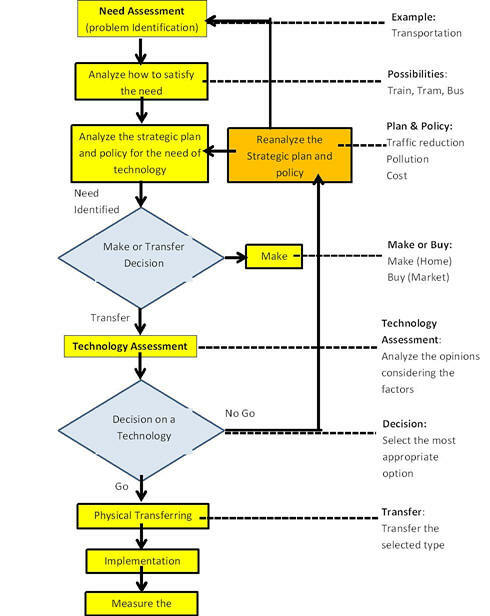 The picture to the right is a simplified model of the technology transfer processes ATC considers for the developing countries (for a more detailed version contact ATC). Each box consists of several steps to be followed in order to confidently move into the next box in the model. An important part of the technology transfer is its assessment. There are several different ways to assess the technology. However, the first step is to have a very clear understanding of the factors involved in such an assessment. The table to the right is mean to offer a simplified version of factors must be evaluated prior to any decision making regarding the actual transfer and implementation of the technology. We at the Advanced Technology Consultants have the requisite background experience, and training to evaluate key factors indicated in the table and have the global network to for a formation of an effective team of experts to thoroughly address your needs. Advanced Technology Consultants brings a large majority of these important tools to its customers.